When we think about alleyways in a neighborhood located in the heart of a busy city, we may think of paved surfaces, graffiti-laden brick walls and garbage dumpsters. In Cooper-Young, the "concrete jungle" takes a different form - the 1.058 square-mile community has several alleyways crisscrossing it, but many are overgrown with weeds, kudzu, power lines and wooden fences. That's why Kristan Huntley, director of the Cooper-Young Community Association, has secured a $2,500 grant from the Strengthening Communities Initiative, a program at the School of Urban Affairs and Public Policy at the University of Memphis. The purpose of the grant is to help fund research to identify what the community wants to do with these unusual alleyways. The CYCA held its first meeting on the plan this month. The red lines mark a couple of the alleyways in Cooper-Young. "It is a heated topic with different opinons from everyone," Huntley said. "We know the goal is to implement this in six months, but that may not be feasible. So when going forward, we want to know what the residents want." The CYCA will distribute surveys at the meeting tomorrow. Huntley said groups of volunteers and members on the community's beautification project have spent up to four hours cleaning out alleyways and have still not blazed a trail through an entire alleyway. "We take hacksaws, weed eaters and machetes and cut back all that stuff for hours but don't make it through all the way because it's such hard work. We have had volunteers proud of their work but we had lost them because of poison ivy or oak," she said. 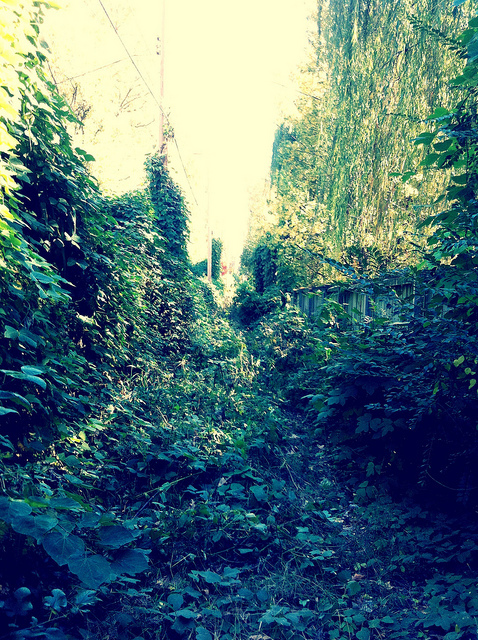 While the work is far from fruitless, after clearing out an alleyway, it will inevitably be overgrown again in a season. Having the alleyways paved would stop the weeds from regrowing and a maintained alleyway would allow the beautification committee to work on other projects that need attention in the community. Andy Ashby, CYCA secretary and Cooper-Young beerfest comittee chairman, said that as a part of the research, the community needs to find out whose job it is to take care of the alleyways- be it Cooper-Young, MLGW or the City of Memphis. "Really, the general consensus is finding out what everyone's thoughts are and if it [having a alleyway project] is a big deal," he said. As the CYCA does not have any set plans for the alleyways, there are ideas of making it into back driveways, much like New Elzey's layout [click here to see the design], or paved jogging paths. Ashby said he already takes his dog on walks through alleyway because it allows him to let the dog temporarily off the leash. In addition, he said he has never felt threatened in the alleyways. Huntley said there have been instances of petty theft in the alleyways where thieves will steal something and then stash it in the overgrown passages, make a break for it and return later to retrieve the stolen item. "I did find a strange wine cabinet, two or three feet tall. Sometimes a discarded jacket, but I'm a grown guy with a dog so I feel comfortable. It is overgrown so it can aid in escaping, hiding out or running down the alley to stash something, then come back at your leisure when the police aren't patrolling," he said. The alleyways used to be a way for residents to access their garage, but over time, they stopped being maintained and used. Also, garbage trucks used to drive through the alleyways for trash pickups. Huntley said the trucks are now too big to continue that sort of service. Things are so overgrown now that residents can't even make it through the entire alley because of the unruly foliage. An empty Steel Reserve beer bottle found in the an alleyway next to Barksdale's Market. In the past, residents have discussed ways in which they could extend their existing property lines into the alleys, Huntley said, but MLGW still needs to have access to the alleyway because of the power lines that run across it. "I don't really have an ideal end result, honestly just coming out with a substantial plan," she said. The CYCA will have to apply for a larger grant from the Strengthening Communities Initiative once there is a solid project plan. Susan Schmidt, Executive Director of the Strengthening Communities Administrative team, said the project was interesting and residents in the community are driven to act on it. "Cooper-Young is well known in the community and it is in the heart of our city " she said. 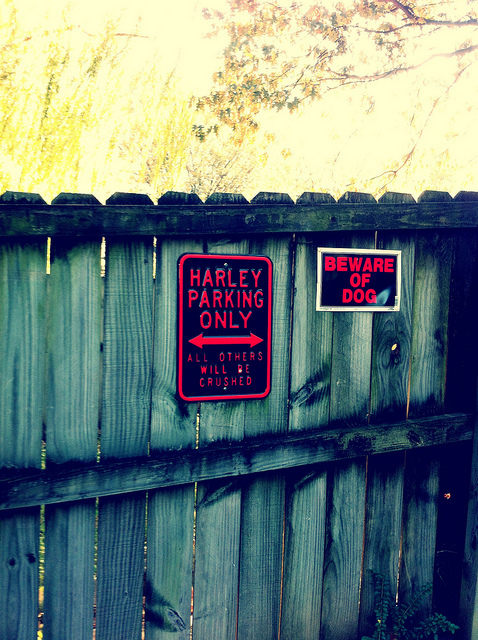 "It has a great reputation, and the residents are engaging. So we know the money will follow through at some capacity." Applications for the grants received are review by a board of students at The University of Memphis in nonprofit management concentrations. 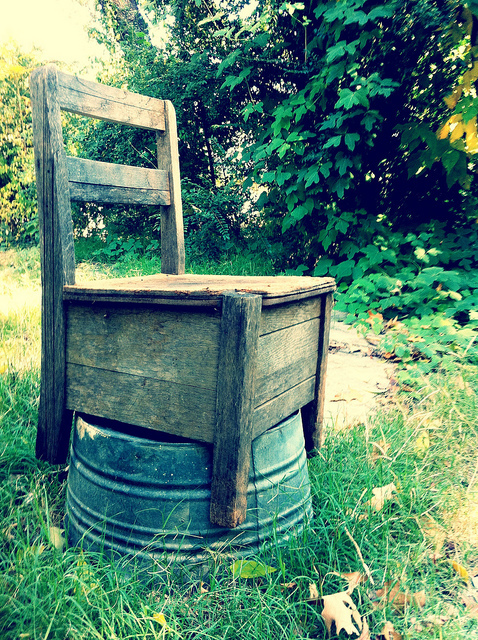 A chair found at the edge of a resident's backyard right before the alleyway. Example of how the foliage blocks off a path in the alleyway. Some residents still use the backway for parking.